Aerodynamo feels at home only in the air. Flight is his first love, and he feels awkward on the ground, especially when alone. The only reason he can stand being in the base at all is when he is around someone else. None of his fellow Maximals can understand why someone who spends so much time alone in the sky, is so paranoid about being left alone when he's grounded. Often he is found out scouting the surrounding area, even when he is off duty. Optimus Primon decided to take advantage of this wanderer and had an energy signature device installed into him to better map the surrounding areas. The Maximal's computer is satellite linked to it, so it can keep scan the area around him, not to mention keep track of his whereabouts. 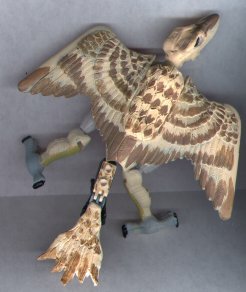 In both beast and robot mode, he can use photon chargers inside of the bird head to blast opponents from a distance. He also has a tail blast shield, but can only use it in his robot mode. 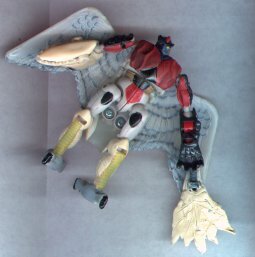 Aerodynamo's sharp eyes can often pick out a Predacon from several miles up, when he remembers to look down. Also, his fast speed allows him to out fly almost anything the Terrorcons can send after him.